The hype that surrounds the Super Bowl is remarkable. Every year the game breaks a viewership record that it already held; the halftime shows get bigger; the commercials cost more and the social media mentions skyrocket. No one who watched or attended the first Pro Football Championship game in 1967 could have predicted what an event the game would become a half century later. It’s an unofficial American Holiday that carries more weight than many official ones. 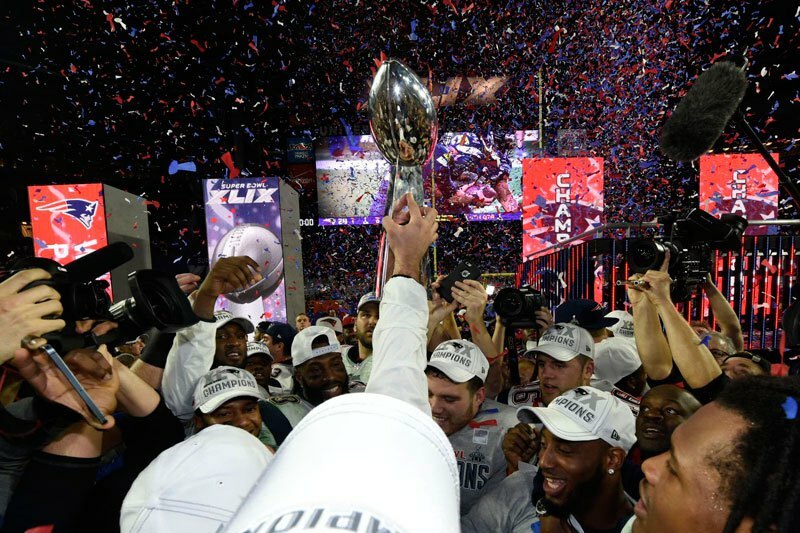 Super Bowl XLIX (the last Super Bowl to use Roman numerals) had the seemingly impossible task of living up to all of that hype. But not only did it deliver on all levels, it exceeded expectations. Two of the best teams in football matched wits in between depressing Nationwide commercials and a lion-riding Katy Perry dancing with sharks and when it was all said and done, the Patriots had won their 4th Super Bowl. This year’s playoffs had already had its share of amazing moments but the 4th quarter of last night’s game topped them all. First, Brady turning a 10-point deficit into a 4-point lead in typical Brady fashion. Two perfectly executed drives (9 and 10 plays respectively) against the best defense in the league. With the Pats leading 28-24 and 2 minutes remaining, Russell Wilson looked prime to do what he did at the end of the first half – lead his team on a TD drive. He got them into New England territory very quickly and then a miraculous circus catch by Jermaine Kearse on a deflected ball put Seattle inside the 10 with 60 seconds left. Shades of David Tyree and Mario Manningham had everyone wondering if another spectacular, out of the ordinary, once-in-a-lifetime catch was going to spoil another Patriots Super Bowl. So much transpired in the final 1:20 of the game that I am still processing it all and I’m sure I’m not alone. Lynch runs the ball down to the 1-yard line and the clock continues to move. Should Belichick have called a timeout to preserve time for Brady after this sure-to-happen Seahawks touchdown? He’s been in this exact position before and decided to let the Giants score the go-ahead TD in Super Bowl XLVI. He didn’t take the timeout this time. Lucky for Bill, Seattle decided to take the ball out of the hands of its biggest goal line weapon. Undrafted rookie Malcolm Butler picks off Russell Wilson on a slant route and the game is over. If that play is completed for a touchdown, we never discuss the play call. Since it’s picked off, it will be talked about for years and some Seattle fans may never be able to let it go. Obviously, I think he should have run the ball with Lynch and if he didn’t get into the end zone, then call a timeout and run it again. It might go down as the worst play call in NFL history, given the circumstances, personnel and stakes but credit must be given to Malcolm Butler who was well prepared. He practiced that specific play, knew what was coming and jumped the route for his first career interception. As Peter King pointed out, Butler made a play in the biggest moment of the game and that’s why the Pats are the Super Bowl champs. It was a great game – maybe the best Super Bowl ever (for fans with no rooting interest in either team) – although that could very well be recency bias. Brady and Belichick win their 4th trophy on their 6th try and they now moves from NFL legends to immortals. Much has been written already and will be written about Brady being the greatest quarterback of all-time. He now holds just about every Super Bowl record there is. The former sixth round pick is tied with Joe Montana having won 4 Lombardi trophies and 3 Super Bowl MVPs to go along with a record 13 Super Bowl Touchdown passes. Despite throwing two interceptions yesterday, Tom finished with 328 yards, 4 TDs and a Super Bowl record 37 completions. Most importantly, he went 13-for-15, with 121 yards and 2 TDs in his final two 4th quarter possessions. Hate or love him, he’s one of the best to ever do it. Tom’s legacy has been cemented and can never be questioned after this win but had Seattle handed the ball off to Lynch and won Super Bowl XLIX, then Tom Brady’s legacy is quite different – and that is absurd. The narrative would be clear. Brady won three early in his career and despite getting back to the big game, he could never get back over the hump. Belichick would of course be included in this narrative and although some would still argue that Brady is the best ever, it would be hard to convince the majority based on his last three Super Bowl outcomes. But even if Seattle hands the ball off to Lynch and wins the game, Brady still delivered a performance for the ages. He struggled at times but overcame his mistakes and led his team back. He was unflappable in the face of extreme pressure against an outstanding defense. Because Belichick didn’t use his timeout to stop the clock, Brady would have gotten the ball back with about 20 seconds left needing a field goal. The game would have likely ended the same way that Super Bowl XLIX ended – Tom coming up short on a game-winning drive and you can see the headlines now: Brady loses 3rd straight Super Bowl, Passing of the Torch, A New Dynasty Emerges. We were so close to that reality but all of that didn’t happen and it will be a universally held opinion that Brady is one of the greatest QBs ever. The outcome of the game has a huge effect on his legacy but it really shouldn’t. He did everything he needed to do in that 4th quarter. Think about this – the Pats are two crazy plays away from winning 6 Super Bowls in the last 15 years. I’m ecstatic that they didn’t because my Giants won both of those games but I don’t know if we will see a QB/coach pairing like these two ever again. It was a Super Bowl that will be talked about for as long as there is football. I’m far from a Pats fan but I definitely appreciated what I saw last night and I hope others did too. While it would have been a fun and intriguing story line had the Pats lost, the outcome of the game wouldn’t change my opinion of Brady. For the rest of the media and NFL fans, it certainly helps his legacy to be on the winning side last night. Finally, there is the other side of the coin. 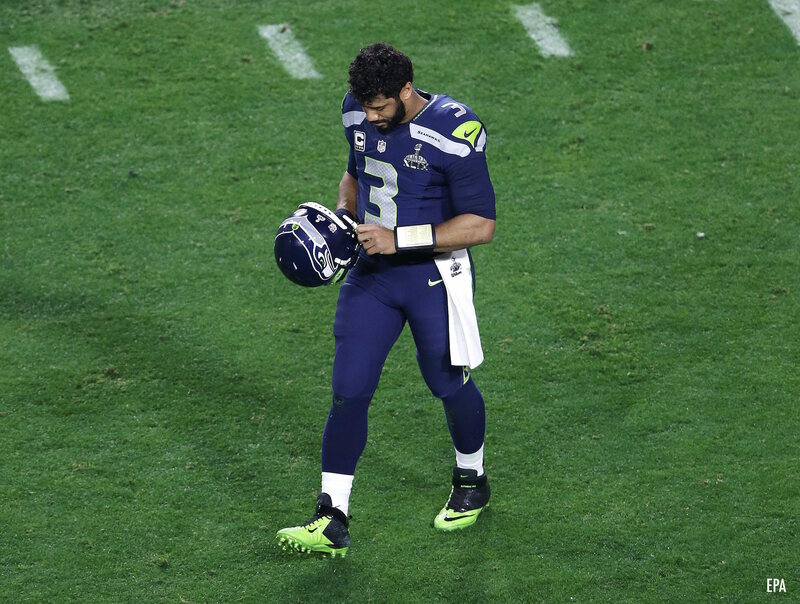 Russell Wilson and the Seahawks lost a heartbreaker in the biggest game of the year. Some might say it’s karma after Seattle won a thriller against Green Bay, who defeated Dallas in ridiculous fashion, who controversially beat the Lions. But this loss will sting much more for the Seahawks than the losses suffered by the Packers, Cowboys and Lions. Pete Carroll had the game won – all he had to was hand the ball to Lynch and rely on his defense to stop the Pats for 20 seconds. But it’s a call that he makes many times throughout the game. Carroll said he was playing matchups and chose to throw against their goal line formation. It didn’t work out and he regrets it. My favorite non-Giant in the NFL is Russell Wilson and I feel for him to have thrown a game-ending interception. The best part about Russ though is his attitude and he won’t let this setback get the best of him. Wilson has overcome many obstacles in his life and this will be another. He’s one of the most exciting players to watch and Russ will be back on that stage again, possibly as soon as next year. A lot can be learned from Wilson in the way he handles himself when winning and when dealing with adversity. Now having been to two Super Bowls and experiencing both victory and defeat, he will only be more motivated to win again. Last night’s game was what a Super Bowl should be. It lived up to its name and here’s to hoping the Giants can make it back to the big game soon. If it’s not the Giants, I’ll be rooting for Wilson and should Brady be waiting there for either matchup, that would be appropriate.